Co Q-10 provides antioxidant protection and cardiovascular support. Aging and poor diet may result in inadequate levels of Co Q-10 in the body. Co Q-10 is essential for the health of all body organs. 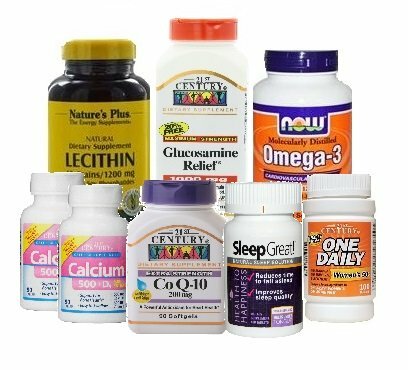 Multivitamin One-Daily Women 50+: Compare Active Ingredients to One A Day Women's 50+ Healthy Advantage. This is a Multivitamin Multimineral Supplement. Lecithin is utilized by every living cell in the human body. It has been shown to support cardiovascular health, healthy brain function, and the health of the liver and intestines. Lecithin incorporates these healthful effects and also promotes higher energy levels, making it a highly effective supplement for dieters. Omega-3 Fish Oil: Supportive but not conclusive research shows that consumption of EPA and DHA omega-3 fatty acids may reduce the risk of coronary heart disease. Sleep Great is a sublingual sleep solution, this is an ideal sleep aid, to help you fall asleep and give you a better nighttime sleep. Sleep Great contains a special sleep blend plus one milligram of melatonin. Unlike prescription drugs or over the counter sleep aids, the ingredients in Sleep Great are not habit forming and have no side effects. Glucosamine Relief: Maximum Strength Formula to Help Maintain the Natural Lubrication found in Joints and Cartilage. Glucosamine sulfate, found in the soft cartilage, tendons, and synovial fluid, is essential to the healthy functioning of tendons and joints, especially with advancing age. Calcium is an important mineral for supporting bone health. Calcium also works to support muscle and nerve function. Vitamin D3 is added to assist with Calcium absorption and as support for immune function. Adequate Calcium and Vitamin D3 is part of a healthy diet, along with physical activity, may reduce the risk of osteoporosis in later life. If you have any questions about this product by Nutrition Expert, contact us by completing and submitting the form below. If you are looking for a specif part number, please include it with your message.